H is for Jennifer L. Holm, author of a fun series about settling the wilds of Washington State. The "Boston Jane" trilogy follows the adventures of Jane Peck when she moves from Philadelphia to Stillwater Bay, Washington (now called Willapa Bay) to be married. It is 1853, and this is definitely wilderness, at least to the white settlers (the local Chinook Indians seem quite comfortable there). Only 16, Jane is the sole white woman on the Bay, and discovers that the skills she learned in "finishing school" (pouring tea and coffee, the art of polite conversation, proper dress, etc.) are of little use when she finds that her fiancee has taken off and she needs to find a way to get by. 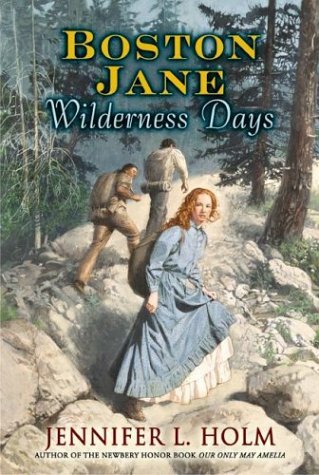 The first book is divided between Jane's childhood and conversion from the wildest of tomboys to a Proper Young Lady, and the adjustment to life in Washington. The second book follows her adventures as she decides to settle in there after all, despite the awful weather (I grew up on Puget Sound. I often pitied the pioneers). In the third book, civilization comes to Stillwater Bay, and it nearly ruins everything Jane has come to love. 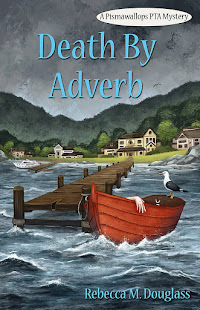 Jane Peck is a delightful heroine and narrator. 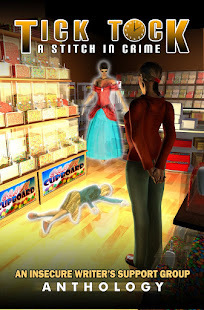 Her silliness and naivete through much of the first book would be annoying if it weren't just plain funny. The humiliations Jane suffers are almost too much at times, but the humor with which they are written--Jane's own underlying recognition of her absurdity--keeps it bearable, and we watch as she gradually recovers the child she was before Miss Hepplewhite's academy taught her to be an airhead. Once she moves beyond that, it is a pleasure to watch her grow and cope with the challenges of her new life, some of them brought on by her own hot temper. 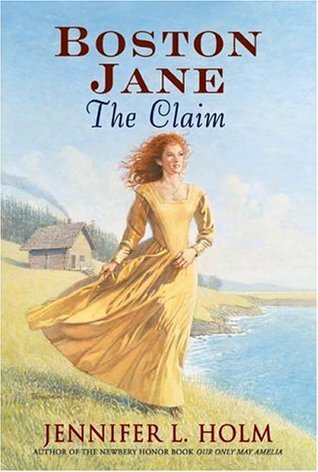 In fact, my greatest criticism of the books is how quickly Jane takes to being turned into a lady (dazzled into it by the opinion of a male--at the age of 11!) and how tenaciously she holds to it in the face of its obvious unsuitability. As a totally unreformed tomboy, I have trouble imagining any girl would give up thinking and speaking her mind, running, and dressing comfortably, for a few bits of praise from a blond bozo. It's not like her own father doesn't praise and respect her for those tomboy traits. And, having been dumped into the wilderness, she is too smart to have clung quite so long to her fine notions about what makes a "lady." On the other hand, well, she's 16, not 50, so maybe reason is a little slower to take effect. Boston Jane gives us a very vivid picture of what it must have been like for the early settlers in the Pacific Northwest, where the winters might not be freezing, but they are even wetter than the summers. Ms. Holm paints the land and the inhabitants with a vivid brush, and sets up the contrast between the cities of the East and the realities of the West in a way children and adults alike can appreciate. 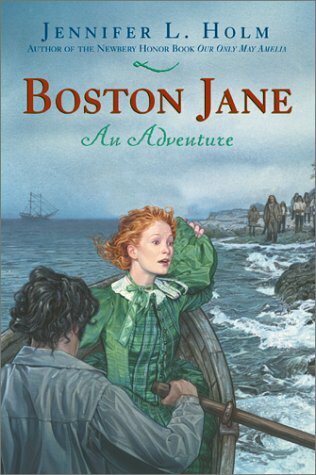 Full Disclosure: I borrowed Boston Jane: An Adventure, Boston Jane: Wilderness Days, and Boston Jane: The Claim from my library, and received nothing from the writer or publisher in exchange for my honest review. The opinions expressed are my own and those of no one else. I am disclosing this in accordance with the Federal Trade Commission's 16 CFR, Part 255: "Guides Concerning the Use of Endorsements and Testimonials in Advertising." LOL! I'm pretty sure it's the same Jennifer Holmes. Thanks for stopping by! This looks like a great story line for my seven-almost-eight-year-old. I think so. Though it is in some ways a bit grown-up, I don't think there's anything to disturb a 7-year-old (more stuff that might go over her head, which is fine). I agree with entirely about the tomboy transformation. ;) They sound like good books, though. They are. But I am here to say that tomboys don't shed that so easily! Flash Fiction Friday: V is for Victory? N is for. . . Nebraska! G is for. . .
A is for. 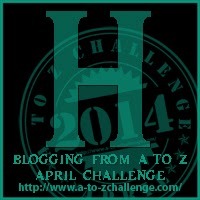 . . A to Z Challenge Kick-off!